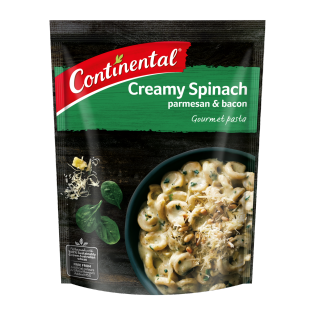 This Creamy Spinach Parmesan & Bacon Pasta combines the finest spinach and parmesan in a true Italian style, with succulent bacon to give it some bite. For an even bigger flavour hit, add some pan fried sliced chicken breast, top with crumbled feta and toasted pine nuts. You will be savouring every bite. Delicious when you add CHICKEN mushroom bacon!! Quick and easy dinner ...and Delightfully tasty! !